Senator Ferdinand “Bongbong” Marcos Jr said his vice presidential bid is in line with his family’s “culture of service” as he again dismissed the atrocities committed under the dictatorship of his father, former president Ferdinand Marcos. In his first public appearance since announcing his 2016 campaign, Marcos attended a press forum on Wednesday, October 7, where he said his family name will help him vie for the Philippines’ second highest position. He said widespread allegations of corruption and human rights abuse during his father’s regime are not election issues. 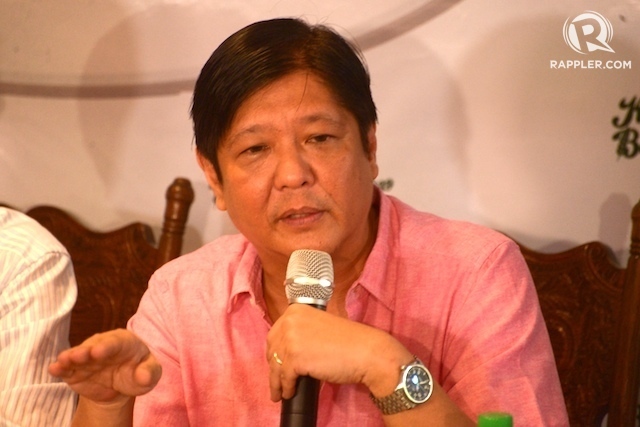 Marcos, 58, announced his independent candidacy through a statement on Monday. He is one of 5 vice presidential bets so far in the May 2016 polls, an unpredictable, crowded election he described as the “strangest” he has seen in his 26 years in government. His vice presidential bid signals the increasing political stock of the Marcos family after the late strongman was ousted in a peaceful uprising in 1986. The family went into exile in Hawaii but have since reclaimed power. Former First Lady Imelda Marcos is a representative of Ilocos Norte, while daughter Imee is governor of the province. The lawmaker admitted that his mother was eyeing another post for him. Marcos though said that he decided to seek the vice presidency because the Aquino administration was against his family. “Anything we do will be opposed as policy by this administration. The time is just not right to run for president this time. The presidency and even the vice presidency are a question of destiny. We do all we can to hopefully gain some advantage when it comes to the elections but destiny will tell you. It is that that is the voice of wisdom I hear,” Marcos said. Asked about his family’s ill-gotten wealth and crimes, Marcos said his focus is public service. He said family and friends will help finance his campaign. Marcos said his leadership will aim to address the shortcomings of the Aquino administration while bringing back the programs of his father, and his own initiatives as former governor of Ilocos Norte. He blasted the partisan politics of the administration. “We have suffered from a lack of leadership and vision. No one says what is his or her view of the next 5 years. In 10 years, this sector should have this achievement. The merits of a program do not count for anything. It’s all about if this person is my party mate, I will get him or her. If he or she is not an ally, even if the idea is good, nevermind,” he said. “Politics has its place but the duty to the country should overshadow other concerns,” he added. Marcos said if he wins as vice president, he will focus on agriculture, as he and his father have done. “I quote the simple statistic that irrigable areas in the Philippines in 2015 are smaller than in 1986. Since 1986, there was no additional area for irrigation. Those that were destroyed were not fixed. That’s why we cannot attain self-sufficiency in rice. Agriculture, to me, is very important,” he said. The senator said he will also boost tourism in the same way he promoted his province. “Tourism is an industry we can do very well in but the infrastructure that will help has not been available. We are stuck at 4.3 million tourists every year, not 10 million because our airports, ports cannot take more and we have not done anything to encourage tourism,” Marcos said. He also plans to harness wind power and renewable energy to help address the shortage in Mindanao and Visayas. Marcos said the Aquino government failed to address basic issues like the drug problem, and the notorious traffic in Metro Manila, proclaimed in recent surveys as the worst in the world. “There is an estimate we are losing P2.4 billion ($51.74 million) every day because of the bad traffic. Not any country can afford throwing away that money for no good reason. That’s because there is no clear plan for the mass transit system. The answer there is the mass transit system,” he said. Marcos also clashed with the Aquino administration’s position on lowering tax rates. Unlike administration standard-bearer Manuel “Mar” Roxas II, Marcos joined opposition leader Vice President Jejomar Binay and independent Senator Grace Poe in supporting tax cuts. Marcos said the government’s tax policy was focused on collection instead of crafting a coherent program incorporating investments. “The tax policy as we have it now has no central principle, rationale behind it except to collect, collect, collect. It’s like it’s in blinders. They do not consider the effect on the economy, the future, different sectors. All we’re left with is to push a lowering of the tax rates. I hope the government comes to its senses,” he said. “Being a Marcos gave me an advantage I would not have if I were not a Marcos. People are kind to me. I grew up into a privileged childhood because I was able to go to the best schools and now I have been able to enter politics. I enjoy the support of many people as a Marcos,” he said.